Just how good are human embryonic stem (ES) cells made by therapeutic cloning via nuclear transfer? How do they compare to induced pluripotent stem (iPS) cells or traditional ES cells made from IVF embryos? A new paper in Nature directly tackles these key questions, but first a bit of context. Three separate groups have now successfully made ES cells using somatic cell nuclear transfer (SCNT), with the successful technique first reported by the lab of Shoukhrat Mitalipov at OHSU last year. I have reviewed those three therapeutic cloning papers (see here, here and here). It’s worth noting that I felt that therapeutic human cloning was the top stem cell story of 2013. 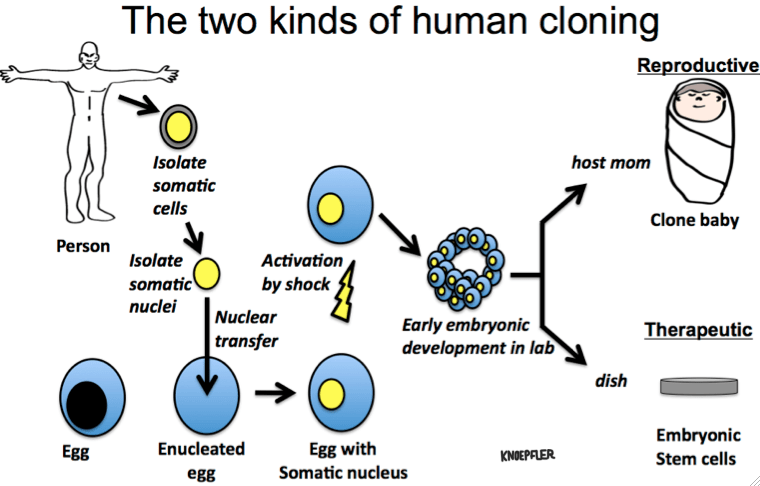 For an illustration of how therapeutic cloning differs from reproductive cloning see a handy illustration here. It is pretty clear then that transferring a somatic cell nucleus into an oocyte in place of its own nucleus is a new, now established method of making human ES cells and this new kind of pluripotent stem cells (termed NT ES cells) is yet another potential tool for stem cell-based regenerative medicine. However, let’s return to the big question: given the power, flexibility, and relative ease of making iPS cells, is there good reason to go to all that trouble to make NT ES cells? Or to put it more bluntly, are NT ES cells any better than iPS cells in some important way to justify how much more of a pain they are to make? Mitalipov’s lab has a new Nature paper (Ma, et al.) that argues strongly “yes” to that question. The paper is entitled “Abnormalities in human pluripotent cells due to reprogramming mechanisms”. In this new paper published today, Mitalipov’s group teamed up with several others has done a comprehensive genomic, epigenetic, and transcriptomic analysis of NT ES cells. They compared them to iPS cells and IVF ES cells with each also compared to parental human dermal fibroblasts (HDFs). The paper argues that in pretty much every way, NT ES cells are significantly more similar to IVF ES cells than iPS cells were. In other words, the authors argue that if IVF ES cells are the gold standard, NT ES cells are closer to that gold standard than iPS cells are. This team also reports that iPS cells have more genomic abnormalities and DNA methylation differences. They also assert that transcription factor-based reprogramming is inherently just not as good as SCNT at reprogramming. For example, in terms of global gene expression, NT ESCs clustered with IVF ES cells (see Figure 6A above; green and red columns of names across the top, respectively), while iPS cells (orange names) were further way and hence less similar. 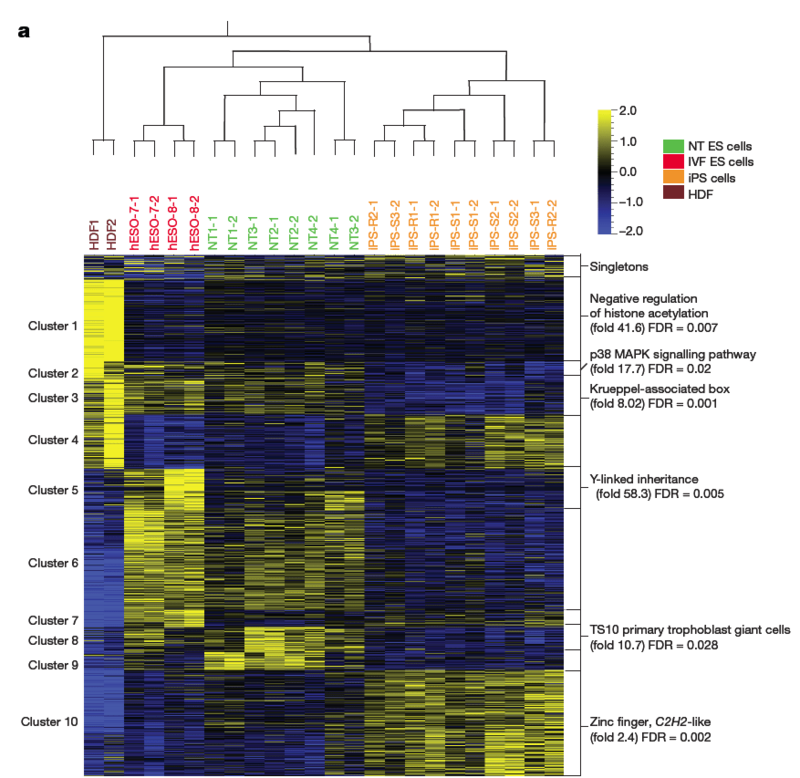 It’s notable that iPS cells uniquely had abnormal expression of Zinc finger protein coding genes (yellowish region of bars constituting “Cluster 10” in the bottom right of the heat map). Overall, the paper is very convincing, but there are a few issues and limitations here that are notable. First, the paper does not provide mechanistic insight into reprogramming. It is basically saying that the inherent physical nature of NT ES cells is better than that of iPS cells. I would have loved some specific insight into why NT is better than transcription-based reprogramming, but I understand that that is a tough nut to crack. By analogy you might say you are comparing two boxers who are going to be in a fight soon. You examine and compare their heights, weights, ages, BMIs, and such physical traits, but until you see how they actually box, can you really predict who will do better? Function over form. To extend this analogy a step further, one boxer (iPS cells) has already boxed in a number of matches over the years and has a proven track record of doing well, while the other (NT ES cells) has never boxed before. I’m sure we’ll learn more from this and other groups about NT ES cell function in the coming months/years. Third (and related to above), the NT ESC paper does not address the endogenous retroviral elements that Yamanaka has linked to differentiation-defective phenotypes of reprogrammed cells. In their Koyanagi-Aoi, et al. paper (reviewed here), Yamanaka’s team made a strong case that specific retroviral elements should be examined as indicators of defective reprogrammed cells. Why not check out those elements in the NT ESCs? I am also puzzled at the title of the paper. Why focus on the negative? A more minor point is that I would have liked to have seen how iPS cells made with episomal vectors compared. Overall, despite a few issues, I would say this is a very important, thorough, compelling paper. I still am concerned from a broader perspective about unintentional enabling of human reproductive cloning as well and hope that more dialogue will emerge on that important element. While from a big picture standpoint I’m still not entirely convinced that NT ES cells (given the egg donation, expense, and complications of making them) will give iPS cells a practical run for the money when it comes to regenerative medicine, at the same time this paper made the case for NT ESCs relatively much stronger. What Does New Paper Mean for Future of Nuclear Transfer ES Cells? OK, so NT ES cells are closer to IVF ES cells than iPS cells. Are IVF ES cells better at regenerative medicine than iPS cells? Do you think iPS cells derived from hepatocytes would be better at regrowing a new liver since they “remember” the tissue they come from? hESC have not been ultimately proven safe and effective in many clinical trials. Who has defined it as a gold standard for regenerative medicine? It also does not alleviate involved ethical problems. NT ES still bear mitochondrial RNA, so beyond epigenetic there is clear source for genetic heterosity. Yet, in term of remaining on the positive side, NT ES could appear as great source for personalized medicine in a way umbilical cord cells became an insurance policy for many newborns. but won’t iPSC derivation and culture be improved to minimize the differences w/ hESCs? The problems of egg acquisition in SCNT would certainly be an incentive to do so. I totally agree with you. iPS cell technology is a young one. Improvements will certainly occur. As Paul said, as their features were not confronted, it will be difficult to say that one solution is better than the other. Moreover, the epigenetic memory could be an advantage in some cases (i.e. making hematopoietic stem cells with blood cell derived iPS). Finally, there is a danger that malicious people want to trade oocytes. And then, the frail of developing countries will be a preferred target. Remember the scandals of organ donors in India or China.